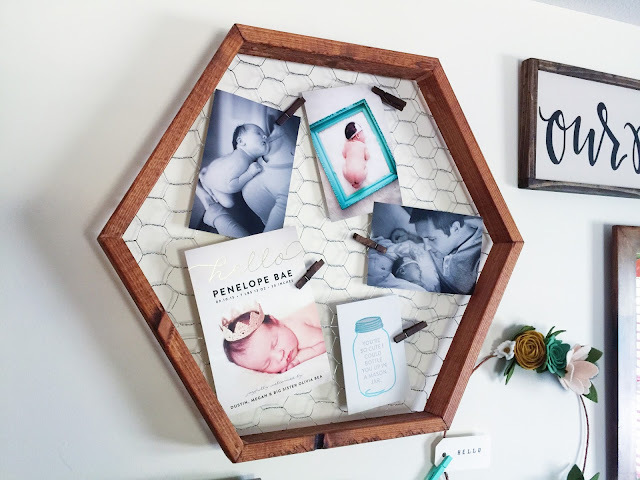 Penelope's nursery is one of my very favorite spots in our entire home and it's been something that has been put together piece by piece over the past year. It is filled with color, so much natural light during the day and lots of treasures from dear friends and my favorite handmade shops. I thought I would share a few of the pieces that have made Poppy's room so special and where everything pictured here is from incase you are designing a room for your little one or know someone who is! 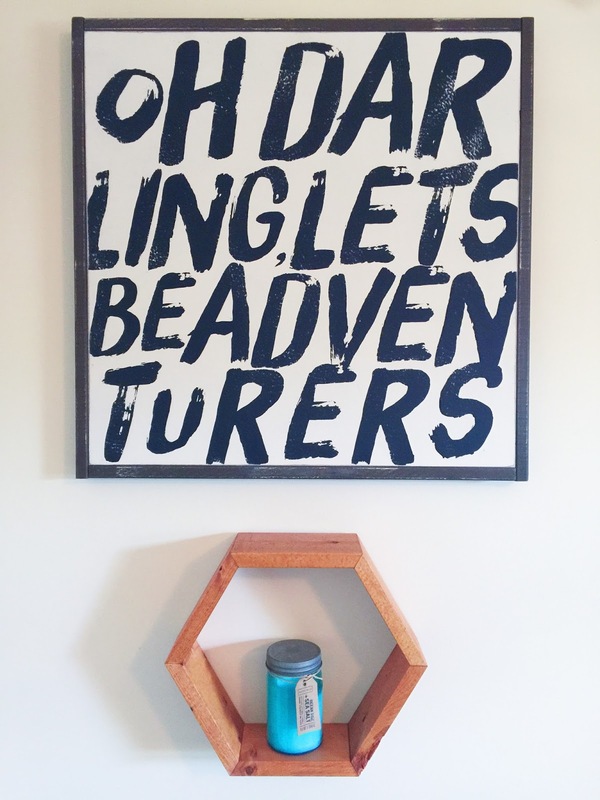 We have signs from House of Belonging in almost every room of our home, I just love every single one in Tiffany's shop and she offers frequent sales through her instagram with 15-20% off which is when I scoop them up. 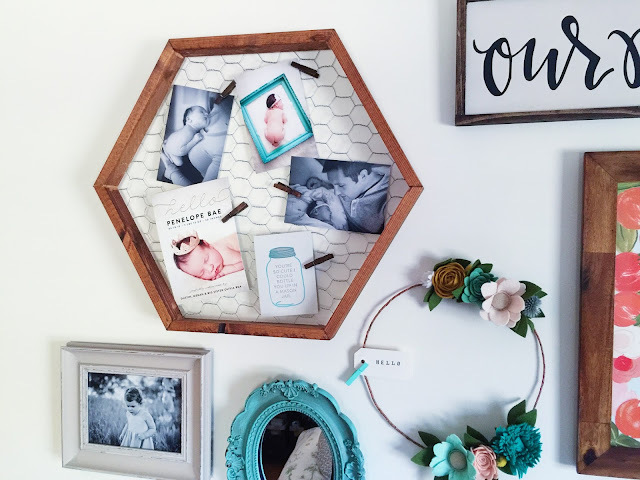 I get a lot of our frames and mirrors from Home Goods and Marshalls, and the white vintage floral hooks pictured are from Target and come in a set of three. Both the girls have chandeliers in their rooms and we often find those at an independent lighting shop in our area. Almost every single light fixture in our entire home is from that same shop, and we often get really great deals because it's so small and we are loyal customers. If you ever have the opportunity, I would highly recommend shopping locally for lights in independent stores versus big box stores. You are more likely to get awesome deals and find incredibly unique pieces that will transform your home! 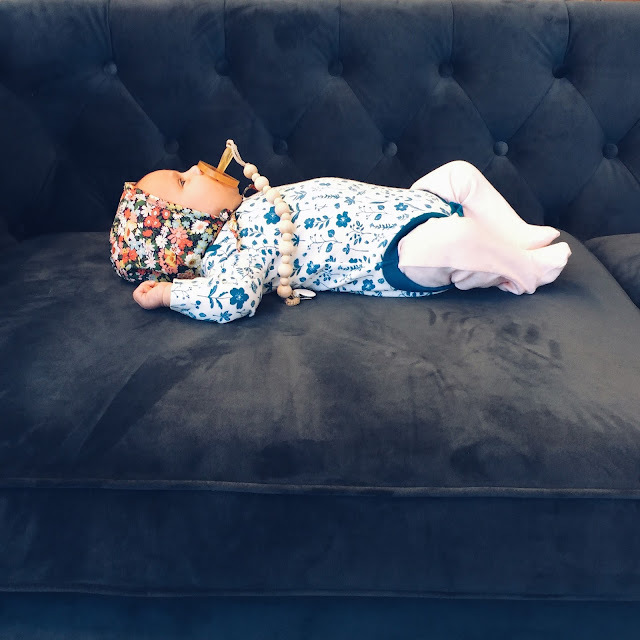 The tassel garland above her crib is from Glam Fete and I also love Studio Mucci, we have a few for parties from them and one hanging in Olivia's room! We recently hung a wooden garland from Coral + Cloud above the crib as well. Our weekend started on Thursday night with some backyard pumpkin carving, our annual jack-o-lantern pizza and a pan full of homemade brownies. Yum. The weather lately has been so gorgeous that we are trying to take advantage of it as much as possible before the snow flies, especially because Olivia loves being outside! Penelope spent the evening in her Moses Basket chilling out next to us. What a fun night with our girls. Friday was busy and a bit of a blur, but both girls took a solid afternoon nap and I cranked out some roasted pumpkin seeds while they caught some Zzzs so it wasn't all bad. That night we planned to have Olivia stay over at Nana's house but I got a call at 11pm that Olivia hadn't yet fallen asleep and missed "Mama and the Baby" so she wanted to come home. I couldn't help but love her more so I headed out to pick her up and she finally crawled into her bed at home around midnight. I don't think she had any idea it was so late but wow was I ever tired! On Saturday we relaxed and between cleaning and a few errands, I camped out on the couch with Penelope asleep on me watching some movies. The past few weekends have felt so, so busy. And while I love having things going on, a slow Saturday was just what I was craving! We've been doing a lot of redecorating (I call it nesting, which Dustin claims I do even when I'm not pregnant!) and we put up a gallery wall in our basement with these floral antlers. 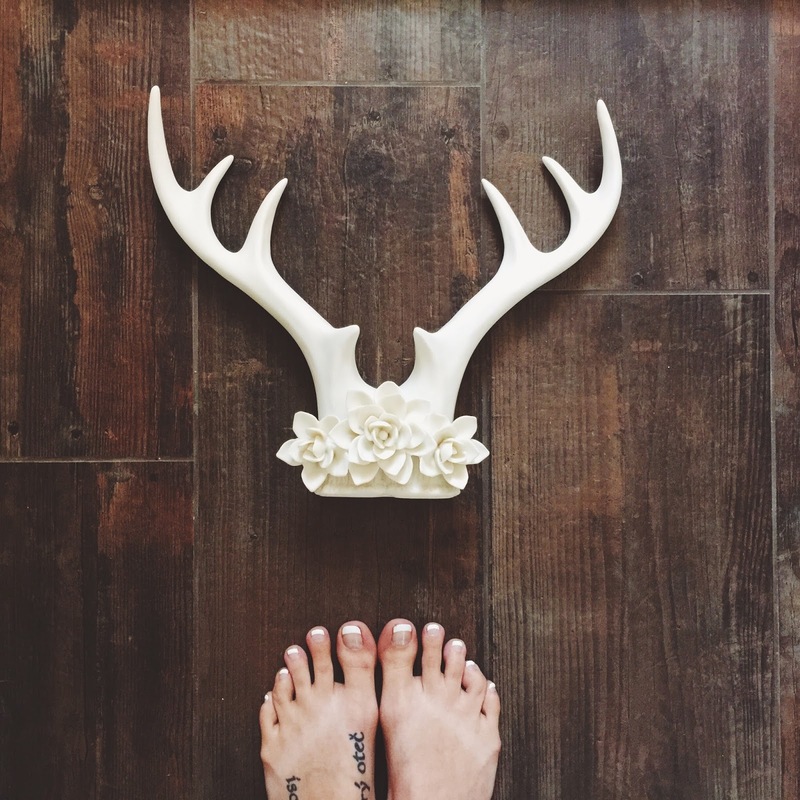 I had been on the hunt for antlers for a long time and fell in love with the simplicity of these and just love how our gallery wall turned out with them at the center! This weekend we also picked up our new dining room chairs. I found and ordered them last week and just loved the rustic touch they add to our dining room and how surprisingly comfortable they are! On Sunday we hosted a Sip & See for Penelope and it was wonderful to have so many friends and family come from near and far to celebrate our new little lady. She slept through most of it, which made for lots of cuddles for all the people that love her so much! This week we have almost nothing on the agenda aside from some more pumpkin carving, fall baking and relaxing...and I couldn't be happier! Hope your week is off to a great start! I can't believe it's almost November! Hello! Hope everyone had a wonderful weekend! The blog was a bit quiet last week, as all three of us girls were feeling under the weather. Thankfully, everyone is healthy again and life with two has begun falling into a really nice routine. For anyone who has two, you know that coordinating naps and finding a balance between caring for both little ones can be a challenge but we're 5 weeks in and I'm so thankful things have gotten much easier as we've established a day to day routine and I've gotten into the groove of two! 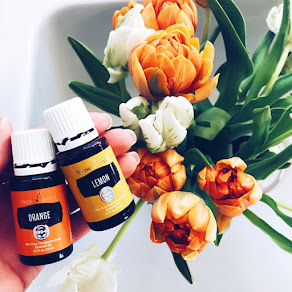 I thought I would share what our routine is during the week and would love to hear how you set up your day with two or more too! The girls both go to bed around 8-8:30pm. Dustin has a bedtime routine with Olivia which includes brushing teeth, getting in jammies & reading books, then I sneak in to kiss her goodnight and "stargaze" together. She has a turtle that projects stars all over her ceiling and every night after Dustin leaves, I go in to lay with her -- she puts her arm around me and points out all the stars. Melt my heart. Penelope has a pretty basic routine of eat / wake / sleep during the day and then eat / sleep at night. We loosely followed Babywise with Olivia and had a lot of success so we are doing the same thing with Penelope. I'm not one to strictly schedule my kids but the biggest thing I took away from the Babywise method is the importance of giving your baby "wake time" after each feeding (during the day), instead of just putting them down right away or letting them drift off to sleep while eating. Wake time during the day encourages better sleep at night. (During the night you obviously don't give them that 20-30 minutes of wake time after a feeding, you just put them back down). If she went down around 8pm, Penelope is usually up between 10pm and midnight for her first night feeding, then again around 3/4am and her final feeding between 7 and 8am. She is averaging 4-5 hour stretches of sleep consistently, which helps me to feel like I'm finally getting more rest too! Penelope usually takes a morning nap after her 7/8am feeding, and this is the time I am really able to focus on one-on-one time with Olivia. Olivia wakes between 8:30 and 9am. We get up, eat breakfast together and hang out, reading books, playing games or her new favorite activity -- doing puzzles. Once Poppy wakes, I feed her and then it's bath time for the girls, around 11am. Olivia loves helping giving Penelope a bath by rinsing her feet or helping me shampoo her hair. P loves being in the tub, so I let her soak as long as she wants and Olivia and I sometimes sit and play on the bathroom floor while she does. After bath time, we try to get out of the house for a few hours. Even though its sometimes a lot of work to get us all ready, I notice my days are so much better when I've gotten out of the house! On Tuesday mornings, I have my women's bible study at church and Olivia loves being in the nursery there. Thursday mornings is preschool for Olivia and then every other Friday is MOPS (Mothers of Preschoolers), which I always look forward to because it gives me time with other moms with children similar in age to mine and it's faith-based. It's an international organization and there are usually many groups throughout each city, so if you've never heard of it and want to get connected with other Moms, I would highly recommend it! My mom attended MOPS for years when I was younger and encouraged me to get involved and I'm so glad I did! After our morning activities, we come home, around 12:30/1pm for lunch. While Olivia eats, I feed Penelope and then it's nap time for both of the girls. Penelope typically goes down first while V is finishing lunch and then I spend some time reading books with V in bed and put her down around 2pm. A perfect day is when both of the girls nap at the same time, but sometimes after I get Olivia tucked in, Penelope is still awake and wants to hang. Although I'm usually tired and ready for a break, it's also really special for me to have one on one time with her while her big sister snoozes. Olivia wakes around 5pm and by then, Dustin is home from work. He gets home around 3:30 each day. I feed Penelope after her nap while V has a snack and then we try to do something as a family. Sometimes it's out of the house, like taking Olivia to an indoor water park or the playground or just taking a walk around the neighborhood but sometimes it's just doing something fun at home, like an afternoon movie with popcorn, playing in the backyard or, Olivia's favorite, reading stacks and stacks of books in bed with Daddy. I try to give Olivia my undivided attention in the morning while Poppy naps and then Dustin does the same in the evening. Olivia is so patient all day with me as I take care of her baby sister, so the evenings are really a time to reward her for her good behavior with something extra fun. 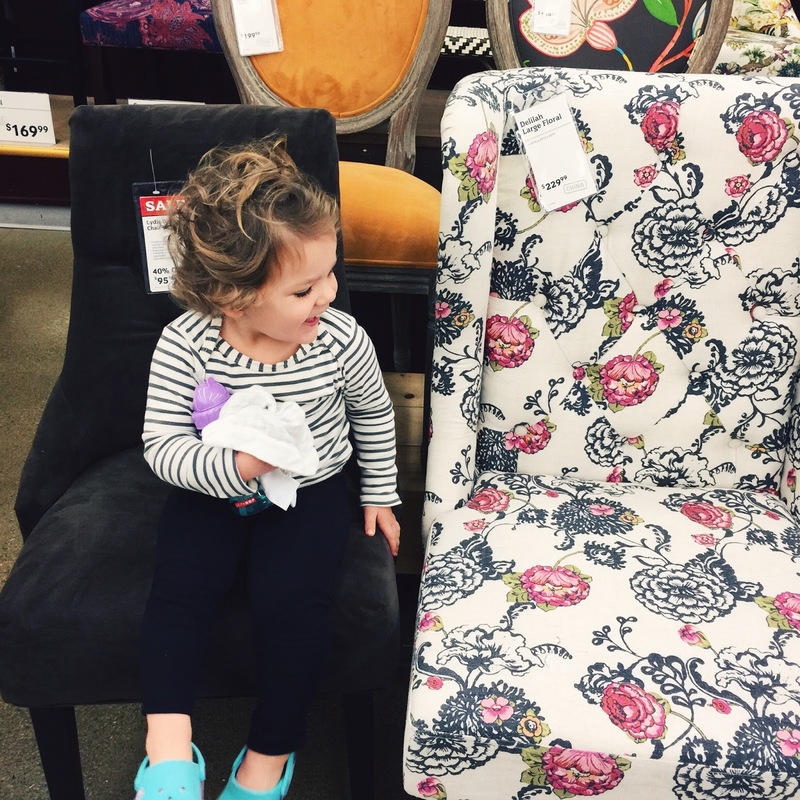 Last Thursday we went furniture shopping to pick out our dining room chairs and can't wait to share what we chose! Olivia had to try them all out of course! Dinner is between 6 and 7pm, Dustin usually cooks while I feed Penelope and Olivia plays with special toys that keep her occupied. After dinner, we tag team it to tackle bedtime! Life is certainly busier with two but so much more fun. 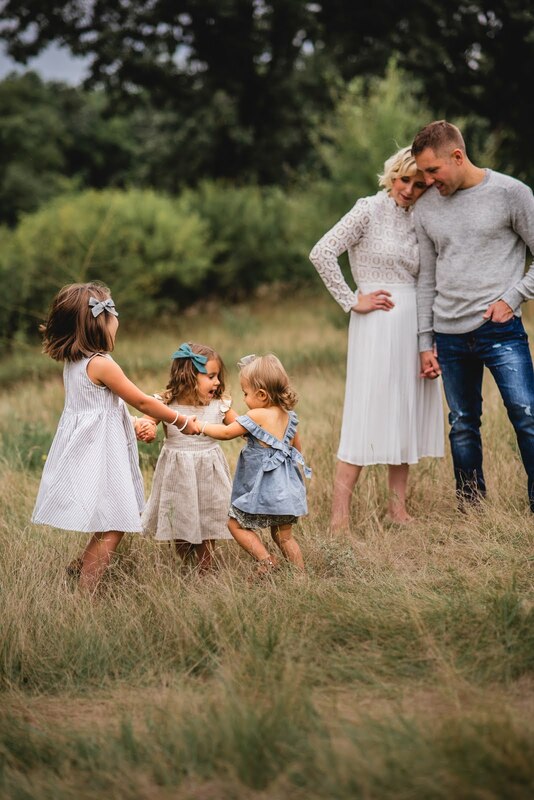 It feels like our missing piece -- sweet Penelope -- is finally with us and our family feels much more complete. I can't believe she's almost 6 weeks old and that time is going by so fast! Her Sip & See is this weekend so we're finishing up some fun projects around the house this week and I'm getting extra excited to have all our friends and family in one place to celebrate our baby girl. It seems time has passed even quicker now than when Olivia was born, but maybe it's because I have two little girls to keep me busy, or maybe as I wish harder and harder to slow down time or stop it altogether from passing, it somehow seems to speed up. One of my biggest focuses going into the newborn stage again the second time was to cherish every moment as much as possible; to memorize Penelope's face, her scent, her movements, her breathing, every little characteristic about her. No matter the time of day, the hour, or what else was going on around me. As a first time mom with Olivia, I felt like my main goal was just to survive. This time, I've been much more intentional with the goal to thrive. To enjoy each day & each night. To live life as fully as I can amidst the exhaustion and expected sleep deprivation. And it's amazing how much different (and better) of an experience it is this time around. Our sweet little Poppy will be one month old on Saturday, and we're so excited to also be having family fall photos done that day. I thought it would be a perfect week to share her birth story, so that's below. My due date (September 7) had come and gone, and I truly had no idea when Penelope would arrive. Olivia was born at 38w2d, so I was quite surprised to be sitting talking with my midwife at 40w2d (September 9) about my options. We scheduled an induction for the following Monday (September 14) and that was that. That night (September 9), around 9:30pm as I was tucking Olivia into bed and reading her books, my water broke. I hadn't been feeling any contractions my entire pregnancy, and labor the first time around started with my water breaking as well. 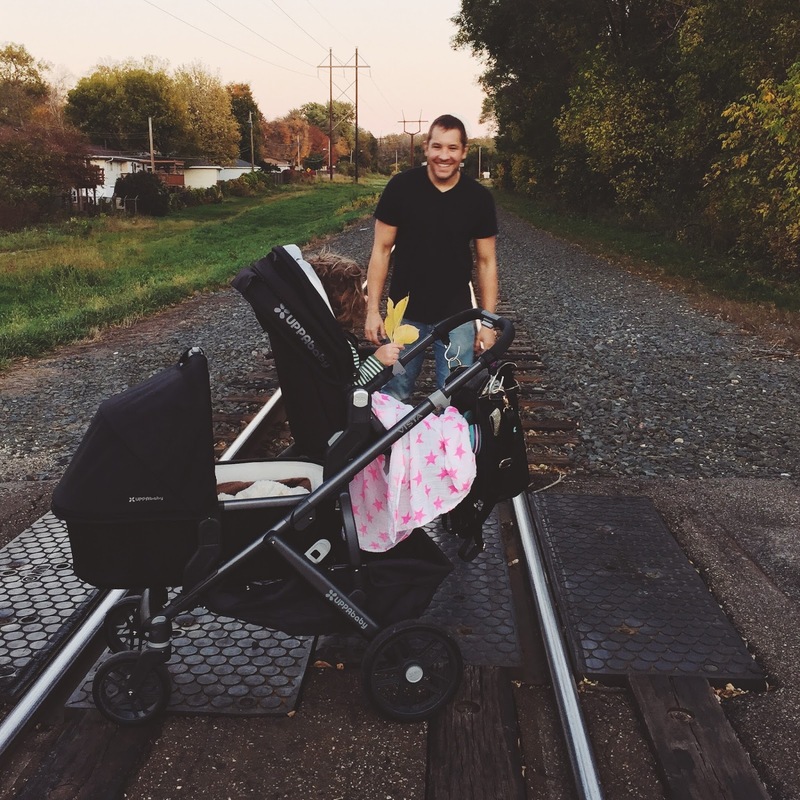 We quickly grabbed our bags, called my Mom to head over to stay with Olivia, and headed out. Side note: I don't think Olivia got to bed until 11pm that night, as she was running around the house beyond excited. I have truly never seen her that excited in my life, it was hilarious to watch. On top of that, Nana is her favorite person in the world so she was pumped up. We got to the hospital around 10:15pm and I was admitted right away. After being put on the monitor, I was checked and at a 5cm (around 10:30/10:45pm) but my contractions were still irregular and not incredibly painful. Around 11:30pm, I got into the soaking tub in our room to labor and literally as soon as I got in, I felt like I needed to push. I'm pretty sure I went from 5cm to 10cm in the blink of an eye. By then my contractions were crazy strong and completely on top of each other. Because I was doing a water birth, I knew I would be moved to the water birthing suite down the hall but my labor was progressing so quickly, the tub wasn't even filled yet. As soon as I was able, I got out of the tub in our room and got into the birthing tub in our new room, right around 12:10am. Five pushes later, at 12:38am, our sweet Penelope was born into the water. Water is incredibly soothing to me; I take bubble baths almost every single night. 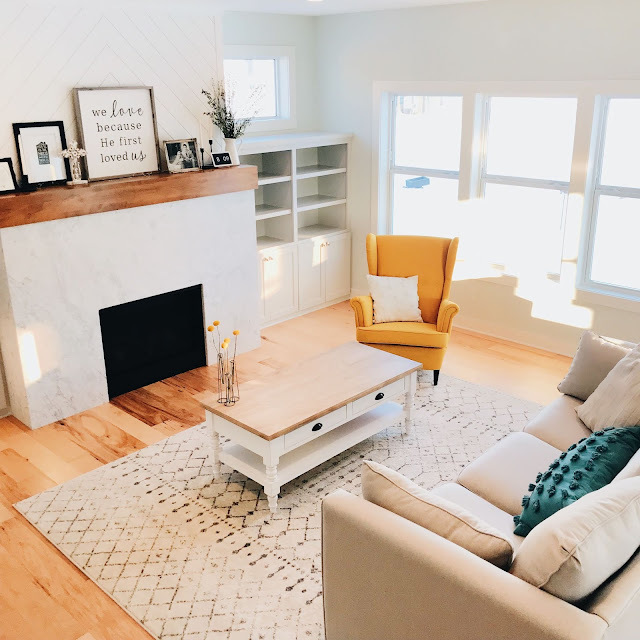 When we found out we were pregnant on New Year's Day, I asked my husband Dustin (who so conveniently happens to be a Master Licensed Plumber) if we could update our master bathroom with a new extra deep soaking tub so I could take baths during my pregnancy. I didn't do a water birth the first time around but knew I wanted to try it and absolutely loved it. Although my labor was still unbelievably painful, I felt so comfortable and at ease in the warm water and loved that Penelope transitioned into a similar environment from that which she came. I plan to do a waterbirth with all my future babies, hopefully even one at home someday! All in all, my labor began at 9:30pm and about three hours later, P was born. I had a long and exhausting 15 hour labor with Olivia so this was a completely different experience, but my Mom was in labor with me for 36 hours so still, no complaints! Happy Monday! Hope you all had a wonderful weekend!! Ours was quite busy and I'm looking forward to a slower-paced week ahead, if that even exists. Today I'm so excited to be featuring Grains of Grace, an incredible shop based in Lake Stevens, WA, which specializes in modern hexagon shelves and other home decor, run by beautiful Mama Jess. "Hi, I'm Jess. I am married to my best friend Blair and I am a Mama to a 15 month old boy, Theo. We live in the great Pacific Northwest, just north of Seattle, WA. Blair and I are both registered nurses and work odd schedules -- night shift, day shift, and everything in between. We love to enjoy walks around our neighborhood, head out to Lake Roesinger on our days off, and go camping for vacations. When I am not chasing my little man around, tending to my home or working on the shop, I love to spend time with my closest girlfriends. These relationships are very precious to me, they energize my mind, and they fill my heart and soul. I could not do what I am doing without the influence of so many God fearing women." "The name Grains of Grace comes from my love of creating things out of wood (grain) and my love for Jesus (grace). I knew before opening my business I would need a ton of grace for myself in order to balance being a wife, mom, and artist. I think many woman are told "you can't have it all" - while there is some truth to that, I believe you CAN chase your wildest dreams if you live a life of grace. Grace for yourself, and grace for others. I'm most inspired when I see other woman and moms designing and creating; it totally inspires me to keep pressing forward." "The most challenging parts of owning my business, if I was to be perfectly honest, are comparison and jealousy. In the social media age it is so easy to find your worth in the amount of followers or the number of likes. I constantly have to remind myself why I started this business. My absolute heart is to add joy to the homes of my customers and reflect the beauty of our creator in each thing I make. Whenever I feel the sting of jealousy I force myself to stop, humble myself before the Lord and pray through those thoughts." "When I am able to encourage others to follow their dreams I feel most rewarded. I recently met a young woman through Etsy who wants to open a shop and I am now mentoring her; I have met so many wonderful people through Etsy and Instagram who have cheered me on, and I love when I can pay that forward to others. The absolute best part of owning my business is having the freedom to create and pursue my artist heart. It gives me the freedom to be intentional with my art and devote time to the gift that God gave me." From the moment I connected with Jess, I could not help but be touched by her kind and sincere heart. She is the real deal and her passion for what she creates, coupled with her genuine heart for God, came through every conversation we had. 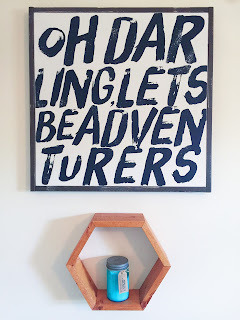 Her pieces are beautifully made and truly perfect for any room in the home; I hung our honeycomb display as part of a gallery wall over our master bed that we completed this summer. 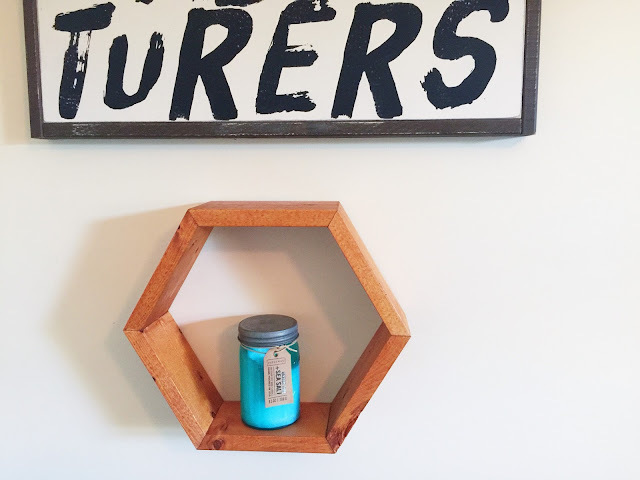 The hexagon shelf is on another bedroom wall, and is perfect to display candles, small books, flowers and more. In her shop, Jess also offers wooden wall arrows with map details, solid wooden arrows, personalized growth charts and more. In addition to the pieces in our home from Grains of Grace, my absolute favorite new item in her shop is her custom house number address sign. Happy Friday! 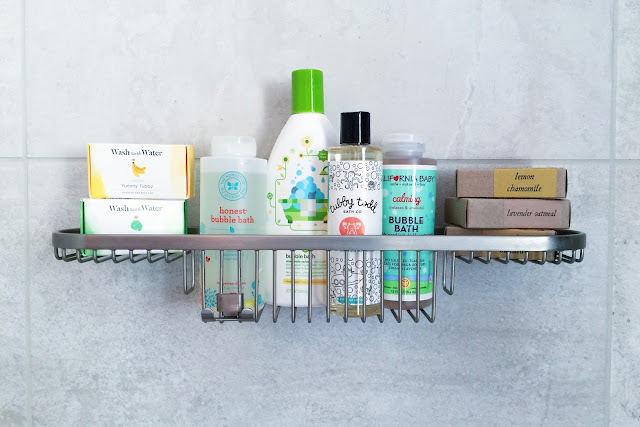 I often get asked what products I use for the girls so I thought it would be fun to share all our favorites that we always keep on hand for bathtime. I love finding products that are high quality, are as natural as possible and of course that smell amazing. Especially when a daily activity of mine is petting & smelling Penelope's fluffy hair. Oh, newborns. We are all about variety in our home and I love using different shampoos, conditioners & bubble baths every day to keep things exciting. Yes, I get excited over bubble bath. shea moisture olive & marula baby head-to-toe wash & shampoo // one of our favorite brands, shea moisture has some of the best smelling products around. yikes, I use it for myself sometimes! I almost always find this on sale at Target and just love love love it! california baby calendula hair conditioner // Don't even get me started on the perfection that is california baby and their calendula line of products; my number one product recommendation for any expectant or new mama is california baby calendula cream...it is a serious dream in a jar and I've used it on both of the girls since birth, for dry skin year round, after baths, for chapped winter cheeks, etc. I notice a difference in how soft their skin is overnight and absolutely love it; calendula is the most heavenly scent and although it's a bit pricey, a small jar lasts forever; this conditioner is the cream version for hair...same amazing smell and richness and a little bit goes a long way!